You can import an external quality model file, generated with a different installation of Sonargraph into the current software system via the menu "File" → "Import Quality Model" . 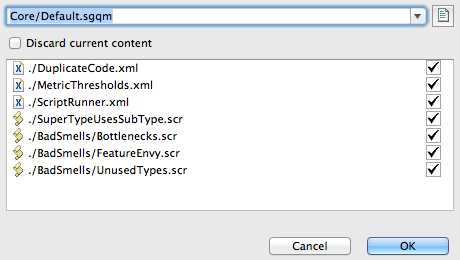 Check "Discard current content" if you want to delete all the configurations and scripts currently loaded and start afresh with the imported quality model elements. If don't discard your current content, quality model elements with equal names will still be overriden by the incoming elements!